Valentine's Day is right around the corner, and as history has proven, getting a reservation at you and your significant other's favorite restaurant can be a bit of a struggle. So why not stay in this year? Not only is making a meal from start to finish a great way to show that you care, but you can also ensure what goes into your dishes. Featuring fresh herbs and vegetables, here are recipes to a multiple-course dinner—and even a cocktail—that will leave you and your date feeling good. 1. Cook the potatoes in a large pan of boiling water for 8-10 mins until tender, then drain and keep warm in the pan. Season the chicken with ground black pepper. Heat the oil in a large non-stick frying pan. Gently fry the chicken with the onion and garlic for 5 mins until both are lightly browned. Turn over the chicken once and stir the onion regularly. 2. Pour over the stock, add 2 sprigs of tarragon and bring to a gentle simmer. Cook for 5 mins, then turn the chicken, add the asparagus and cook for 3 mins more. Chop the remaining tarragon. 3. Stir the crème fraîche and tarragon into the pan with the chicken and heat through, stirring, for a few secs. Serve with the new potatoes. 1. Bring a large pot of water to a boil; salt it. 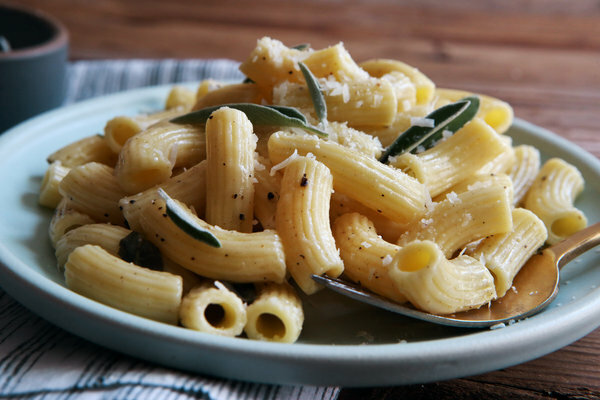 Cook pasta until it is tender, but not quite done. 2. Meanwhile, place butter in a skillet or saucepan large enough to hold the cooked pasta; turn heat to medium, and add sage. Cook until butter turns nut-brown and sage shrivels, then turn heat to a minimum. 3. When the pasta is just about done, scoop out a cup of the cooking water. Drain the pasta. Immediately add it to the butter-sage mixture, and raise heat to medium. Add 3/4 cup of the water, and stir; the mixture will be loose and a little soupy. Cook for about 30 seconds, or until some of the water is absorbed and the pasta is perfectly done. 4. Stir in cheese; the sauce will become creamy. Thin it with a little more water if necessary. Season liberally with pepper and salt to taste, and serve immediately, passing more cheese at the table if you like. Sift flour, sugar, salt, and baking powder into the bowl of a standing mixer. In a medium bowl, combine oil, egg yolks, lemon juice, lemon extract, lemon rind, and bitters. Stir to combine. On a low setting, start to beat the dry mixture and slowly add the wet. Increase the mixer speed to medium and beat until incorporated. Transfer mixture to another bowl. Wash and dry mixer bowl. Whip egg whites with whip attachment on medium-high speed until foamy. With the mixer on medium speed, add cream of tarter and slowly add sugar. Beat on high speed until stiff peaks form. Scoop a cupful of the stiff egg whites into the batter and stir to combine. This should lighten up the batter. Transfer the batter to the egg whites and gently fold until there are no more streaks of egg white. Scoop into cupcake cups about two-thirds full and bake at 350 F for 22-25 minutes or until a toothpick comes out clean. Makes 20 cupcakes. Whisk the egg whites and sugar over a hot water bath in the standing mixer bowl until it reaches a temperature of 110 degrees Fahrenheit. This only takes only a few of minutes. Transfer to standing mixer and whisk using whisk attachment at high speed until soft peaks form. With the mixer on medium speed, drizzle sorrel syrup into the mixer. Splash in a bit of bitters. Beat on high until stiff peaks form. Add sugar and water to a small saucepan set over medium high heat. Heat the mixture until the sugar dissolves, stirring occasionally with a wooden spoon until fairly thick, about 2 minutes. Transfer to a small bowl. Stir in sorrel and set aside to cool. To Assemble: Pipe meringue frosting onto cupcakes. Toast with a culinary or blow torch. *Prepare simple syrup as you would normally, but add rosemary to the mix. Discard after the sugar dissolves. These meals are delicious and highlight microgreens, perfect for those who have nutrition on their minds, but don't want to sacrifice taste or romance. To get the most out of your meals, try preparing these recipes with Urban Cultivator-grown herbs and vegetables. Offering an enormous variety of greens, Urban Cultivator gives you the power to harvest your own microgreens, herbs, and vegetables anytime of the year (which is especially important if you're colder areas of the world.